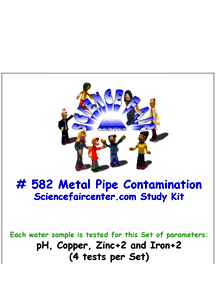 Metal Pipe Contamination by Water Tests for metal pipe and plumbing corrosion from water before and after not using pipes. Metal Pipe Contamination by Water Tests for metal pipe and plumbing corrosion from water before and after not using pipes. Experiment for a first time science fair project. Testing only takes a few minutes per sample. Each water sample is tested for this Set of parameters: pH, Copper, Zinc and Iron+2 (4 tests per set). Test metal pipe and plumbing corrosion from water before and after not using pipes.